Cape Town - Johannesburg - Victoria Falls - Kruger Park - Johannesburg, is additional. Accommodations include a King Suite at Victoria Falls Safari Lodge and a Spa Suite at Kapama River Lodge. This exclusive Romancing Africa safari through South Africa and Victoria Falls will get any traveler’s heart racing with exhilarating activities, exciting game drives, and romantic moments, leaving you with memories to cherish for a lifetime. 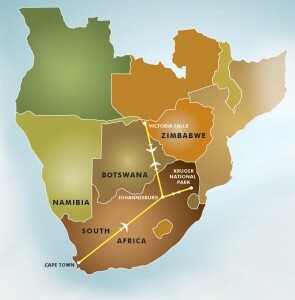 Start your Romancing Africa adventure through life together with this adventure through Southern Africa. Including gorgeous vistas along the southern Cape, wine tasting in the magical winelands, thrilling shark diving, hot-air balloons, game drives, spa treatments, one-of-a-kind views of Victoria Falls, and so much more. Begin your adventure in Cape Town, a gorgeous city nestled between white-sand beaches, majestic mountains and lush green countryside. Start the excitement early with a full day Great White Shark cage dive and come nose to nose with this colossal king of the ocean. Venture into the Winelands for a private tour and gourmet tastings of the fabulous wines, chocolates and cheeses. Hug a cheetah at the Cheetah Outreach Center then discover 250 species of birdlife including African penguins at the Cape of Good Hope. Wing your way to Victoria Falls, where you will explore the area on a guided walking tour through the forest, under a canopy of chattering monkeys. A memorable elephant interaction, culminating with a delicious breakfast in the bush. Choose whether to soar high in the sky for a birds-eye view of the falls via helicopter or count to three and bungee jump over the water-filled gorge. At this point you deserve a relaxing break, so settle in on a romantic sunset cruise on the Zambezi River and watch as hippos and crocs float by. Kruger National Park is one of the largest game reserves in Africa and offers amazing opportunities to explore the bush by land and by air. Take off in open safari vehicles on guided game drives to discover the Big 5 in Kapama Game Reserve. Track elusive leopard on foot during guided nature walks, learning the secrets of the bush from professionals. Take a breathtaking, early morning hot air balloon ride across the wilderness then soak it all in during a “his and her” spa treatment at the luxurious Kapama Wellness Center. Whether you’re newlyweds, celebrating your golden anniversary or you just want to share an unforgettable adventure with someone you love, Romancing Africa will bring you closer together and give you more amazing memories than you could ever dream. Spy penguins, seals, ostriches and cavorting baboons on a full day drive to the tip of the CAPE OF GOOD HOPE. Standing at the edge of the continent, perhaps you can see where the Indian and Atlantic oceans meet. Enjoy a thrilling SHARK CAGE DIVING ADVENTURE. The Great White shark makes it’s graceful and swift appearance from just below the sea level, leaping out of the water making its presence felt from nowhere. Enjoy another full day of glorious scenery travelling via private tour through the WINELANDS: tour a vineyard, samples the wines, chocolate, and cheese, as well as admiring the old Cape Dutch architecture at Stellenbosch. You will also get to visit to the popular CHEETAH OUTREACH CENTER for the opportunity to learn about and interact with these incredible animals; Africa’s oldest felines. Enjoy a multi-hued SUNSET CRUISE on the mighty Zambezi River, watching out for crocodile and inquisitive hippos. Explore the impressive Falls on a guided WALKING TOUR through the rainforest and then mount a gentle giant for an exciting ELEPHANT INTERACTION. Continue the adventure with your choice of a birds-eye HELICOPTER RIDE above of the falls, or a once-in-a-lifetime BUNGEE JUMP over the gorge! Stay in a KING SUITE while at this accommodation. Fly to the big city – busy reinventing itself as a trendy metropolis. Your hotel is across from the airport for ease of travel. Enjoy a luxurious night’s rest. Kruger Park – where the wild things roam, is the approximate size of Rhode Island and teaming with wildlife. DAILY GAME DRIVES put you within touching distance of lion prides, unpredictable buffalo and herds of elephant feeding in ghostly silence. Keep a keen eye out for shy leopard and endangered rhino. If you’re in the mood, don’t miss the chance to feel nature “close up” on a WALKING SAFARI. Top off this amazing journey with a serene HOT-AIR BALLOON journey across the reserve, and then enjoy a relaxing and romantic spa treatment at the LUXURY SPA WELLNESS CENTER. Stay in a SPA SUITE while at this accommodation. If you have a bit more time to explore, consider adding a Botswana safari, or a few days lazing on the white beaches of the Seychelles islands. As tonight is our last in Cape Town, I pause to consider our wonderfully arranged tour. We enjoyed the quality of each of our accommodations and your guides. Our limited time in Johannesburg was well used to gain an overview of the country’s history. We are big fans of the quality of the Jackalberry Lodge, Thornybush Game Reserve, accommodations was outstanding and the safari staff and setting created a lifetime memory. Victory Falls and Zimbabwe was another both wonder of Africa and window into political damage. The Plett was a well-timed taste of relaxation, with Odtshoorn’s acccomodation alone made the trip there worthwhile- not to mention the ostriches and meerkats. The drive with good music exposed us to the wide-open spaces that define most of the country. In Cape Town, the tw0 hotels have been so well situated and with fine service. We have felt privileged to enjoy each of them. Thank you for your ongoing care, we are grateful for all your efforts to enable our first trip to South Africa that was so rich in diverse and memorable experiences.